There’s an old Chinese proverb which sums this up. “Wá tah aah sy am.” (say that five times really fast). 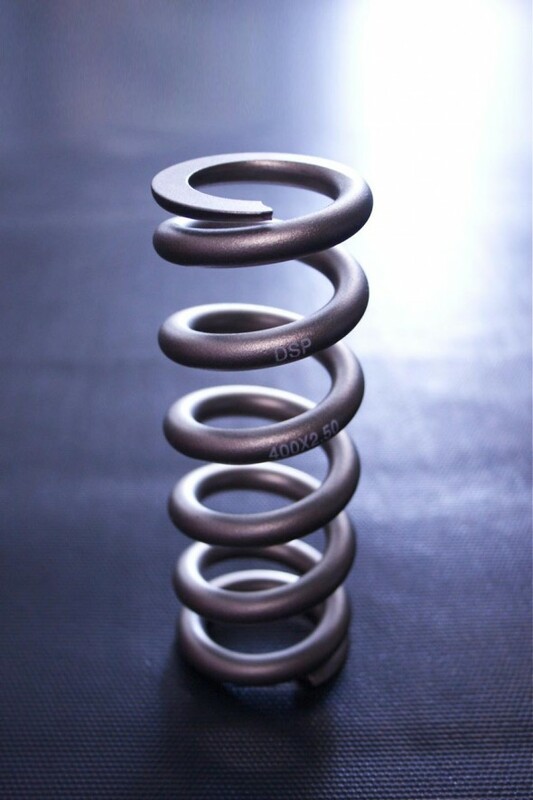 Diverse Ti Spring. 400 x 2.5. 293 grams. That’s about what I was thinking when I had put off buying a Ti spring for about a year. Up until recently, I never gave it a serious thought, as the steel spring on my Fox DHX 5.0 felt fine. I always thought, a Ti spring wouldn’t be much different in performance and was more for bling factor. All that soon changed when I decided to beef up my Knolly DT from 36 – 39+ lbs. 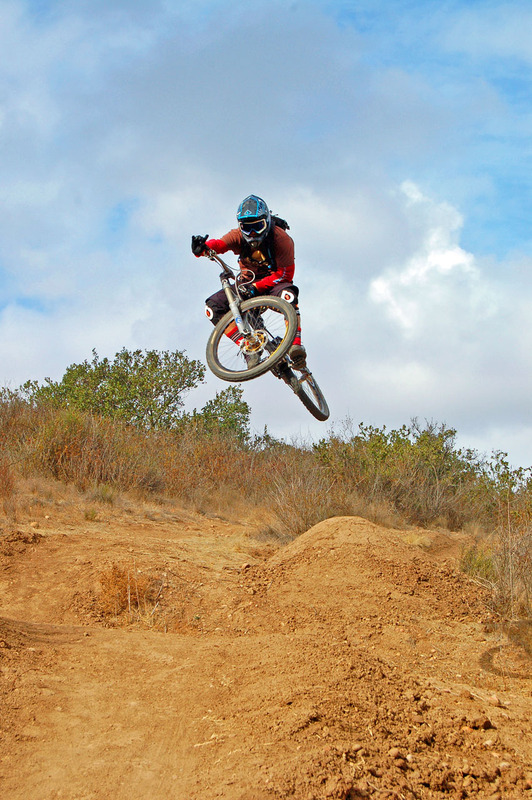 My riding was getting more progressive and I was trying bigger things, which meant wearing more gear that put me at about 165-167 lbs from my previous weight (low 160’s). It was beyond the capacity of what a 350 lb spring could handle at the time. Hearing my dilemma, a friend with a spare loaned me his 400 lb steel spring. As soon as I put it on and got out to the trails, I could tell immediately. 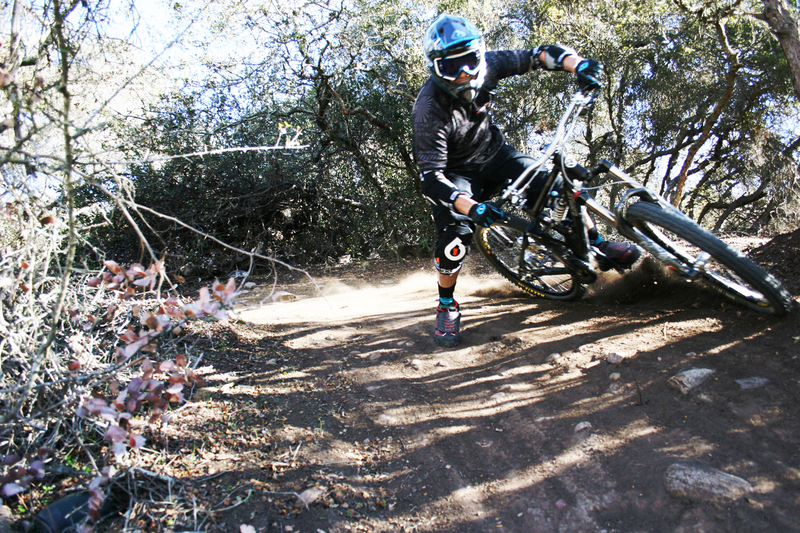 The pedal bob was noticeably reduced and there was a nice pop when going off jumps. After a couple of weeks, I was sold on the 400 lb spring, but for kicks, I took a spin on my buddy’s bike who was running a Diverse Ti Spring. My reaction was, “Whoa!” There’s something different here. The whole point of a Ti spring is to save weight and depending on your spring weight, you can shave from ½ lb to 2 lbs of dead weight. For my 400 x 2.5 spring, I would venture to guess I shaved at least a ½ lb. Holding each spring, steel in one and Ti in the other, the Ti was considerably lighter. It would have been nice to weigh it, just to get a apples to apples comparison, but that was not a big concern as I was more excited about the improved riding characteristics. Plus, I wanted to ride the thing. Diverse’ literature explains… “the lower weight (of Ti) improves suspension dynamics and response. This reduced mass and inertia increases the natural frequency of the spring.” In caveman talk, imagine if you had to chase down your dinner and can last about a 100 yards. Somehow you managed to lose 40 lbs without losing any muscle strength. Just think of how many more rabbits you’d be bringing home to the ladies back at the cave. 😉 Well, that’s kind of a stretch but you get the idea. What I noticed about the Ti was a more responsive spring, the rear end felt livelier and smoother through the travel. It seems like I could feel what the bike was doing more. 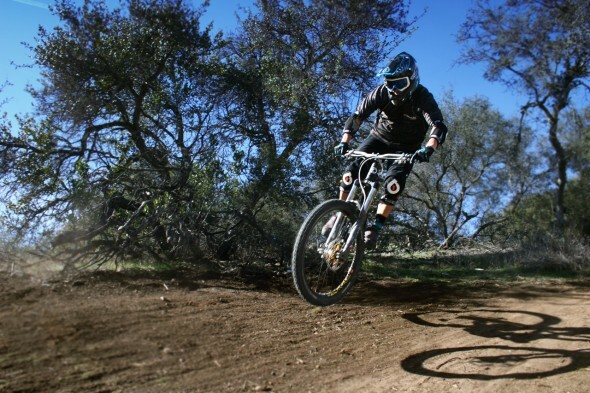 Whether it was climbing or going downhill, it just made the ride more fun and enjoyable. With better performance out of the shock, the tires felt like they stayed planted to the ground better and gave me more confidence to push the bike more. 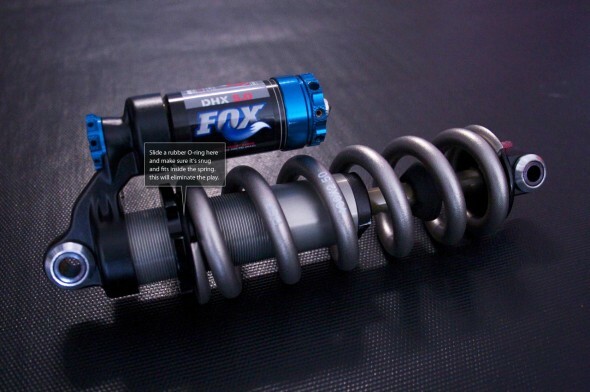 Fox DHX 5.0 Coil w/ Diverse 400 x 2.5 Ti spring. Considering how difficult it is to work with titanium, the Ti looks like a piece of sculpture compared to the neanderthal steel spring. Once on a bike, you get this “moto” look which just makes you want to get it out on the trails and do that “brappp brapp brapp” sound before you charge down the hill. Definitely trick looking. Fit wise,something all Fox DHX 5.0 Coil owners should know, there’s gonna be a little play as the inside diameter of the spring is larger than the Fox’s preload adjuster. This is something unique to Fox and the work around is to use a rubber o-ring to eliminate the play which can be purchased from a hardware store. 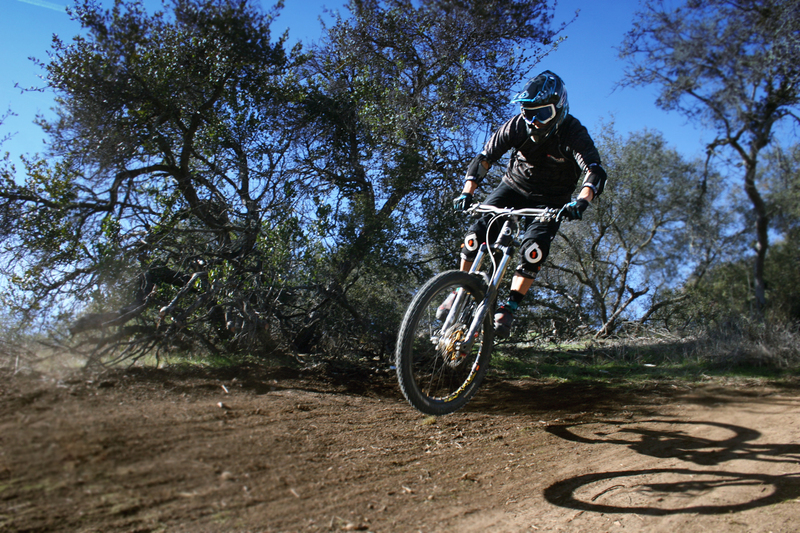 According to Diverse, the spring will work with: Cane Creek, Fox, Manitou, Marzocchi, Progressive and Elka. 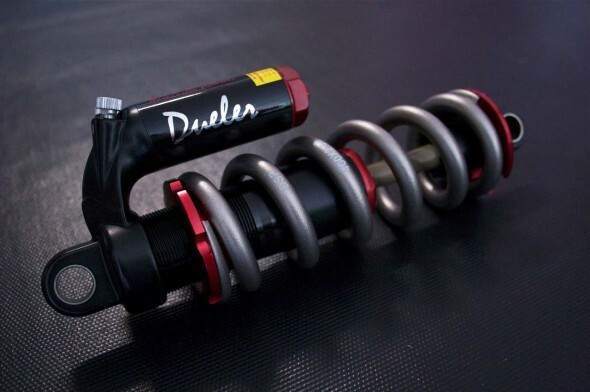 I had an opportunity to try out the DSP-racing Dueler with the Ti spring setup but wasn’t able to give it a go. My Knolly DT frame didn’t have enough clearance at the front eye shock mount; so I was a little bummed to say the least. From a pure visual comparison, the shock looks well made and feels solid. There are separate LSC and HSC along with Rebound adjuster knobs. What’s nice is that they’re easily accessible and require no tools to adjust. That alone, made it compelling coming from my DHX; but even more compelling is the sticker price at $389.95 with a Ti Spring. At that price, I think some people would consider getting an additional one as a spare. I’ll have to give it another shot when I get a different bike built up. Diverse is an easy company to work with. If you’re shopping for a Ti spring, hit up Fadi at 661.618.2644. He’s very helpful and will get you dialed in on the right spring. More info can be found at diverse-mfg.com. GOOD: Obviously the weight savings. Ride and feel is greatly improved which translate to more fun and enjoyment for you. Your boring trails will take on a new life. BAD: Larger inside diameter of the spring means play at the preload adjuster for Fox DHX Coil users. It’s neglible and more of a nuisance. I blame Fox more. The Five Ten Karver shoes share some common characteristics with the Five Ten Impact 2 Low top shoes, so this review is somewhat of a follow up. I have a dozen rides on these Karvers. There are a few similarities, like the fit and feel but some of the new features deserve a closer look. The Karver looks like something straight out of the film Mad Max Beyond Thunder Dome. It has a beefy posture and topped off with lace shield protectors. They look like they’re about to crash through a brick wall. There’s no question these shoes were made to do battle on your favorite trail, jump track or gravity line. They are also equipped with the ultra-tech Stealth S1 rubber that will help you stick to your pedals like pine sap to your hands. Built on the Impact 2 type design and constructed with almost the same panels, they fit about the same. If you love your Impact 2s, these will be your huckleberry friend in no time. Your feet will have the same wrapped feeling with overall improved support. Riding with Five Ten Karver. Photo Brian Roark. I won’t go into how these shoes work (See Impact 2 review), but what’s different about these shoes are the new bells and whistles that make them even more desirable. Although I must admit at first, I wasn’t too thrilled about the Pollock paint swirls, but they grew on me when I got them out on a ride. The Karvers are better than I expected. For those who like the high top shoes for their support and protection, the Karver’s inside mid-height ankle protectors also do the same thing. The beauty of this design is that you retain the flexibility of a low top but also gain the added protection for those occasional ankle clacks to your crank arms. The lace shields are removable so you can wear the shoes without them, although what would be the point? The shields protect your laces from snagging on shrubs and branches as well as help keep dirt and debris out. This is really noticeable on dry and sandy trails. At the end of my rides, I take off my shoes and the laces are completely clean. This should help to prolong the life of the shoes as laces are the first thing to fail. You can see the entire collection of mountain bike shoes on their site at fiveten.com. GOOD: I didn’t think Five Ten could take one of their tried and true product and make it better, but I’m glad they did. BAD: Weight is still possibly an issue but seldom do you find light weight shoes that will last as long. The Velcro on the shield may eventually wear out from repeated on and off. I’m not even going to beat around the bush with this review. If you use flat pedals and are looking for something grippy to help you stick to your pedals, stop reading this review now and just go buy these! I’m not even kidding. 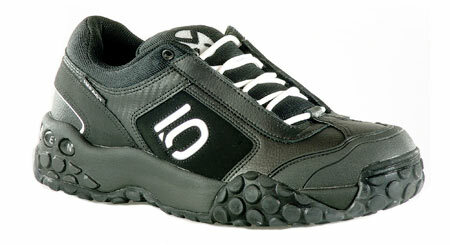 Five Ten shoes are hands down, the best gripping shoes you will put your feet into. This company has its origins in rock-climbing, where the difference between staying on the rock and falling off is determined by how well you can stick to it. They’ve been doing this for a long time and probably know a thing or two about making shoes that perform and function as needed by its wearer. I wore the Impact 2 low tops for a little more than 10 months, with 3-4 rides a week – doing some quick math (being conservative), I have about 120 rides on them. Retailing for around $95-$100, it breaks down to about 80¢ per ride. I’d say that’s a bargain for the kind of performance these shoes provide. With any shoes you really need to go try them on first. Not all models fit the same. The models I have used – Impact 2 low, Impact 2 high, Karver and Nathan Rennies all run true to size. The fit is about the same on the Impacts and Karver (similar design construction) but felt slightly looser with the Nathan Rennie. I have thinner feet, so it just required a little more synching down on the laces. If you are coming from a pair of skate shoes, the Five Tens will feel clunkier, stiffer and heavier than you’re accustomed to. I didn’t like them at first but was willing to tough it out (I heard too many good things). They just needed some break-in time. Do what I did and wear them to work for a week – just walk a lot in them so they’ll be great on those hike-a-bikes. And when the weekend rolls around, they will be feeling so nice, you’ll need to make room next to your Air Jordans for them. Stealth rubber keeps you planted on your pedals. What makes these shoes special is the Stealth rubber compound that offer an obnoxious amount of grip. So much so, that I’ve had to remove a few pins from my pedals so I can get my feet off quicker (as needed of course). Even in wet and muddy conditions, these shoes will stick. They are the closest you can get to being clipped in without going to cleat shoes. As an example, when you need to reposition a foot on a pedal. 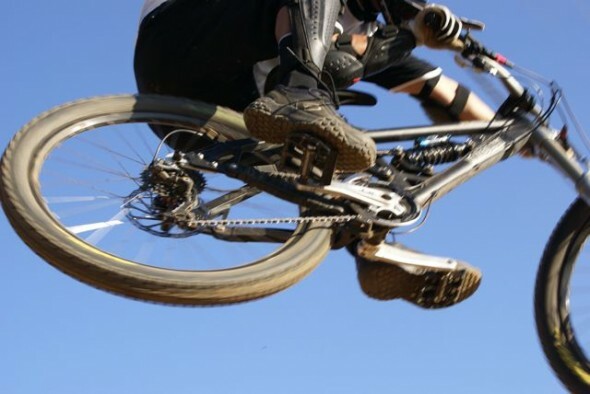 You literally need to lift your feet off the pedal and reposition them. It’s difficult to move them without doing this. The are that grippy. The shoes are basically bomb proof, using synthetic leather, winbuck and rubber. The stealth rubber soles cradle the shoe body, wrapping around from the bottom to the sides, front and rear with more rubber used in the toe box area. If you’ve ever ridden through rocky trails, then you’ve experienced rocks flinging up and at your toes. This is one of the reasons why I love these shoes. Rocks just ricochet off them. While they have a little heft to them, the benefits far outweigh any weight savings. Unique to the Impact 2 shoe design is the tounge; integrated into the inside sidewall of the shoe, is a continuous piece of material that wraps around your foot for additional ankle rolling support. The shoe uses a barrel lacing system that sits tucked under the shoe uppers. This design not only reduces pressure points but also keeps the laces protected as it is not on the surface of the shoe. After 10 plus months of use, the barrel lace eyelet gave out on one shoe. I contacted Five Ten inquiring about whether it would be covered under warranty… and not only did they replace them for me, but they let me upgrade to the new Karvers. That’s just a classy thing for a company to do. 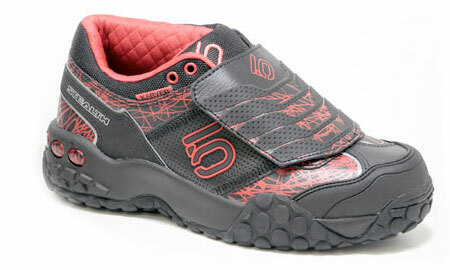 Check them out at fiveten.com or call customer service at 909.798.4222. GOOD: In all categories, fit, comfort, support, durability, protection and performance; there is no equal. This will be the best money you’ve ever spent. Unbelievable warranty replacement program. BAD: I may need to reclassify this as “not so bad”. If I could improve one thing, it would be to reduce the weight. The Six Six One Evo pads are probably the most well known pads on the market. With World Cup racing and Red Bull Rampage appearances; it’s hard not to notice what many of these riders are wearing. It’s pretty simple. They’re streamlined, look good on about any rider and pretty high-tech. This is really an important thing that all the other criteria is dependent upon. Duh right? You would think? The thing is, if you get this right, all the other criteria stuff should fall in line for you. I found the EVOs to run larger than expected. I typically wear a medium for most of my gear but these nearly fell off me when I tried them on. In the Small, at first they felt snug and firm but not uncomfortable – there’s a reason for that, they break in after your first ride and will fit just right. So its better that they start off snug. Since the neoprene and Velcro straps will stretch and break in. With a good fit, you should improve your chances of having comfort. But comfort can be measured on a couple basic levels. How’s it feel wearing them and are the materials used in construction play a role in that? Both the elbow and knee pads use neoprene wetsuit material, elastic mesh, what feels like a soft internal liner along with the famous D30 foam that serves as the space-age shock absorbing material. When you marry these things together, the feel is plush (think nice golf bag) and it allows the pads to be ultra flexible. The protection comes from the D30 Foam, under impact it hardens up and provides an almost impenetrable shield. The easiest way to think of it is like water; it’s pliable and penetrable when diving into it. But from a higher height and moving at a high rate of speed, hitting water is comparable to hitting concrete. It’s that tough! You can cover your hand with it, then have one of your buddies take a rubber mallet and smack it hard, your hand will be protected (I didn’t try it myself, but saw a demonstration of it at a bike event LOL). To cap it all off, vented kevlar is used on the front panel to protect from abrasion (so it doesn’t snag on shrubs). While I’m impressed with the design and form factor, the grey elastic mesh on the rear doesn’t hold up as well as I’d like. When putting them on or taking them off, the velcro straps tend to grab onto the elastic meshing and eventually will turn it from a smooth surface to one that looks a little fuzzy. The other thing that happens is the material will appear to be stretched and distressed with use. After my 3rd ride I began to notice it. Sidebar: These pads are like a high-end wetsuit. They offer all the creature comforts you’d want but start to show wear and tear at the end of winter. Like a set of tires, they wear out. If I can get through 6 months with them, I think I’ll be happy. The elbow and knee pads both use a double elastic velcro strap, one on top and one on the bottom. There’s a belt loop design for the straps to keep them from flailing around; which makes it easy to get them on and off. Riding with 661 EVO pads. Photo Jason Cardillo. The elbows are easy enough to figure out. They are labeled with a L and R so you know which side to put them on. They slide on and you’ll feel it when they are in place and it’s a matter of synching down the strap to where you like them (same with the knees). The knees oddly enough aren’t labeled with a L and R. But they do have a left and a right knee specific pad. You just want to make sure that the end of the straps come up from the inside of your legs and wrap around to the outside. One minor inconvenience is that you can’t slip them on while wearing your shoes but it’s a small tradeoff considering that they provide good all the way around protection and additional support for your knees. So, how do these things work? I was very pleased with how easy it is to move with them on. No binding sensation from the straps. The notched opening where your elbows and knees bend doesn’t have any material bunching, so movement is not impeded. Once you throw your leg over the bike and go, you literally forget they are on. Pedaling with them is a breeze and they stay in place. After a while, you might need to adjust them a little – no pad will stay in the same position throughout the day. Although there’s ample amount of venting holes, you do sweat in these but that is to be expected with any pads you wear. The Elbows on the other hand, I have mixed feelings about. They do slide down your arms more so than the knees – and this is really more about your body shape. With the knee, the lower straps wrest firmly in place just above your calf muscle and so the bulge in your calves will help keep the pads up. But on your arms, unless you’re blessed with Popeye forearms, you don’t have that dramatic bulge in the forearm muscle to keep the straps from moving down. Obviously, depending on your arm shape, you might have better luck than I did. That all said though, I can live with it because they fit snugly and I like the support. How do they protect during a crash? I was unlucky enough to have a couple opportunities to experience them for myself. My first crash, I went over the bars and landed forearm first, doing a full forward roll and landing on my stomach. I ended up with a bruised AC joint (shoulder). I didn’t slide much, it was more of an impact crash. My knees were perfectly fine. Elbows, not a scratch. The pads stayed in place and did their job. On my second crash, I hucked a decent hip and went up about 7 -8 ft in the air, over-cranked a whip and was coming down fast on a fade away landing. The landing couldn’t accommodate that altitude and I wasn’t able to fully straighten out the bike. When I landed, I fully compressed and slammed (felt like hitting a wall). As a result, I bounced off the bike to the bottom of the landing. I landed on my back and left side, the momentum rolled me forward and then I came to a stop. Luckily I had my trusty helmet on to save me from a big headache. As I stood up to do a injury check, the pads were still in place, albeit dirty, but not a scratch on me. I got lucky, it could have been a bad fall. Do I trust them? After two good falls (I’m still recuperating from the soreness of the second one), I think my confidence is more shaken than my fear that the pads will not work. Performance wise, they work as advertised and they’re one of the most comfortable pads I’ve worn (compared to Troy Lee, Fox, Roach and Dainese). Sometimes, I worry about getting a pedal to the shin and would prefer to wear a knee/shin guard but “knock on wood” I haven’t slipped a pedal since I’ve converted to the Five Ten shoes a little more than a year ago. This could be debated whether it’s something you’d even follow through on because pretty much it’s guaranteed that you’re going to abuse the product. That said, 661 has an awesome warranty reputation and is tops in the industry. They have an incredible crash replacement program for their helmets. Depending on the nature of the product failure, you pretty much can get anything replaced. Find them on the web at sixsixone.com or call toll free 888.520.4888. GOOD: Quality construction and comfort. Flexible, no biding and pedals great. Offers additional support to elbows and knees. Overall form factor and design looks great. BAD: The elbows need more fudging and if you have wimpy arms, you may need to do more of it. They could be warm for summer time riding as they are made from wetsuit material. As like a good wetsuit, if you use them a lot, they won’t last more than a season.